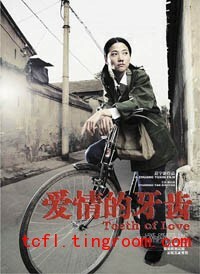 Set in China in the '70s and '80s, Teeth of Love tells the tale of three painful romances in the life of Qian Yehong (played by Yan Bingyan), as a young woman and in middle age. And while the film is all about love – unlike most films set in this era, which usually focus on how China was affected socially – director Zhuang Yuxin's take is a particularly pessimistic one: His characters are forever suffering. There are female and male protagonists – all tortured by love. The film begins in Beijing in 1977, the year after the "cultural revolution" ended. At school, Qian leads a gang of girls and behaves like a boy, fighting and bullying classmates. She doesn't seem to be aware that she's a girl; when a boy writes her a love letter, she insults him in public, which leads to tragic consequences. Years later, we meet a Qian who has been forced to leave her lover – a married man. Yet when Qian is finally reunited with her own husband after years of separation, she finds that she has become accustomed to living alone. The day before their divorce, her gentle husband leaves her with a cruel souvenir. Kudos to actress Yan Bingyan, who gives an excellent performance, especially in the first part of the film, playing a frustrated woman struggling with love.